Nokia Launched Nokia 6 Android Smartphone with Snapdragon 430 Processor,4GB RAM, 16MP rear camera. Lenovo K6 Note also comes with Similar Specs. Check out Price, Specs, Features comparison between Nokia 6 and Lenovo K6 Note. Lenovo K6 Note comes with 3GB/4GB of RAM and 32GB of internal storage whereas Nokia has a 4GB of RAM and 64GB of storage option both devices supports MicroSD card. 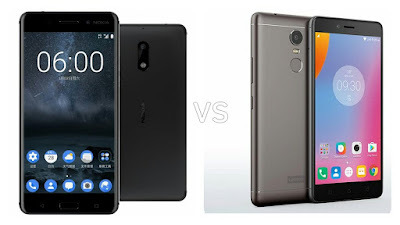 On camera, both has a 16-Megapixel rear camera with LED Flash and 8MP front facing camera.Connectivity options include Dual-SIM Dolby Atmos,4G LTE, Wi-Fi 802.11 b/g/n, Bluetooth 4.1, GPS.Nokia 6 runs on Android 7.0 Nougat out of the box compared to Marshmallow on Lenovo K6 Note.